A quick fling. When you’ve got a lifespan of a few weeks, you have to live them to the fullest. When I was younger I ate a lot of poisonous pipevine leaves, but now that I’m an adult I’m into all-natural nectar. Photograph used with the permission of © Craig Turner / ZSL. Diet: Any leaf within a 2 foot radius that doesn’t blow too much in the wind. Sleeping 20 hours a day in red mangroves where I spend practically all of my time. Don’t judge me: These leaves don’t have a lot of energy, so I don’t either! Exploring the world – there’s a tree 8 feet away that I’m really curious about; I also think about descending from the tree canopy and pooping on the ground about every 9 days. 2) my island – it’s the only place where me and my cohorts exist! 3) My high energy work-out mix that includes “At Last” by Etta James, “Can’t Help Falling in Love” by Elvis Presley, “Stay With Me” by Sam Smith, and “Low Rider” by War. A local guy – friends keep trying to set me up with my larger, mainland cousins, Bradypus variegatus, because there are so few of us (we’re critically endangered), but I want a mature, classy guy from my own island (Isla Escudo de Veraguas) with beautiful orange markings on his back who can treat a gal right – but only for a short period of time; I need lots of ME time. Height: 2-3 feet. I’m usually bigger at meadows and much smaller within closed canopy forests. I’m a long lived perennial herb with white flowers and leaves in whorls of four. I’m part of the pink or carnation family (Caryophyllaceae). I enjoy hanging out both in forests and open meadows. I prefer nocturnal pollinators as my partners. Although, bees like to visit me during the morning, I only release my pollen at night when nocturnal moths come visit me. In addition, I stop producing scent after I get pollinated. One date per flower is enough. During the months of June to September I’m out searching for potential dates. In fact, I produce most of my scent and nectar at dusk to be attractive. -Why my other common name is Widow's Frill. Gorgeous nocturnal moths such as Campion Coronet Hadena ectypa, American Ear Moth Amphipoea americana, Master’s Dart Feltia herilis and Common Looper Moth Autographa precationis. Hadena ectypa female moths oviposit on my flowers and later, their larvae feed on my flowers and fruits. I tolerate this behavior as long as there are plenty of other Silene stellata friends around me to ensure high pollen deposition and high seed set. If there aren’t enough S. stellata individuals close by, then the cost-benefit between seed predation by the H. ectypa moth larvae and pollination by the adults result in negative reproductive fitness for me. Image by John Kress, Smithsonian Institution. In gardens and nurseries, I go by several names such as: Black Magic, Blush, Flame, Flash, Gold, Hot Flash and Red Flame. Height: I am tall and slender, reaching up to 15 feet tall, with a breadth of up to six feet. Body Type: I am an upright herb with bright, blue fruits. I have long, dark green, banana-like leaves and my colorful bracts hold and showy flowers, perfect for attracting my ideal pollinator. Diet: I can be found in part sun/part shade areas of Caribbean islands. I like to stay hydrated, but I prefer well-drained soil and am on a low-sodium diet to look my best! I am an herbaceous, evergreen plant that tends to grow in gregarious clumps. I prefer light breaks and soil disturbances within tropical forests. My bracts create their own ecosystems. My peak flowering time is between April and May. That is when I need my pollinators, the male Purple Throated Carib hummingbirds (Eulampis jugularis). I can reproduce by seed and by rhizomes but prefer to produce seeds. Producing sweet nectar to attract those Purple Throats. My long showy leaves which can be up to 4 feet long. Bats love to build nests under my leaves. As long as my roots are firmly planted and I get water, I do just fine. My pollinator, the male Purple Throated Carib hummingbird (Eulampis jugularis) is the only creature for me. Without the PTC, I cannot produce seeds. I really need that bird! I produce very colorful inflorescences. In the right conditions, my bracts can range from light yellow to red and even various shades of green. A male Purple Throated Carib to include me in his territory. I can treat him with my sweet flower nectar. Height/ Body Type: 7 inches long and squishy, much like a wet marshmallow. I’m a sea slug, but am called a “sea hare” because the sensory organs on my head, called rhinophores, look like bunny ears. Eating and reproducing. I only live for about a year, so that’s pretty much all I have time for. As I hermaphrodite I can be either male or female. I’m also really good at finding other sea hares using chemical cues. When we find each other, a bunch of us will line up and attach so that we can form a love chain! I’m a very graceful swimmer, especially for a slug! Gracilaria, a type of red algae. YUM! My cousin, the octopus, gets all the attention. I can ink, too, ya know! My ink actually acts on the chemosensory systems of would-be predators, disrupting the chemicals that make me an attractive prey item, or attracting the predator to the ink instead of me. It can also warn other sea hares of danger nearby! I have the largest neurons in the animal kingdom and only about 20,000 of them, so I’m a favorite study animal for neuroscientists. 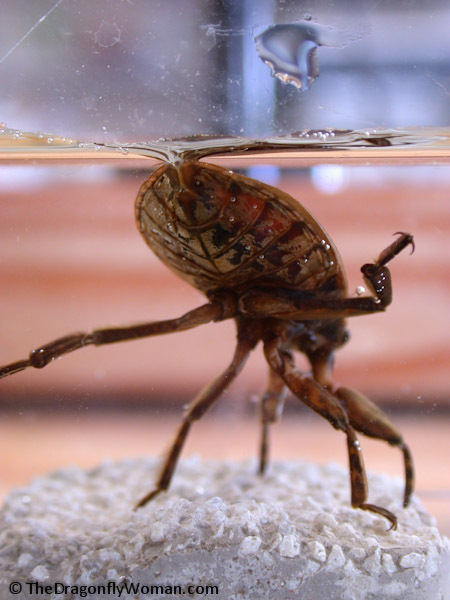 Image by Cotinis 2011, via Bug Guide. About me: I am a very good flier, but I can usually be found in still or slow moving fresh water, such as a lake, marsh or pond. The most private thing I'm willing to share: When under water, I use respiratory tubes, called airstraps, to breathe. Favorite Food: I only eat what I can catch. Using my raptorial legs, I will ambush my prey. While I will eat most small invertebrates or vertebrates, my favorite meals are dragonfly nymphs and snails. Looking for: Male that will be willing to carry approximately 100 eggs on his back until they hatch. Familiarity with basic childrearing techniques a plus. This may include air brooding, where the male keeps the eggs at the water surface, or brood pumping, where the male uses his hind legs to increase water flow over the eggs to ensure they receive enough oxygen. Must also provide eggs with protection from predators, especially the water bug Notonecta undulata.